Sign at Silva Bay, the initially proposed site. 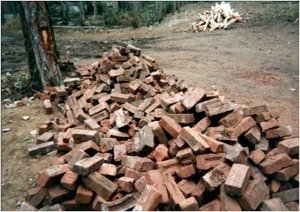 Historic bricks collected from the Gabriola Brickyard , to be used for construction of the Museum building. 2015 will mark the 20th anniversary of the opening of the Gabriola Museum. The vision and tenacity of the group of volunteers who came together initially in 1986 and who worked tirelessly for nine years to transform their dream into reality is part of that same innate desire to collect, preserve and interpret history and the environment that has given rise to the creation of museums since time immemorial. 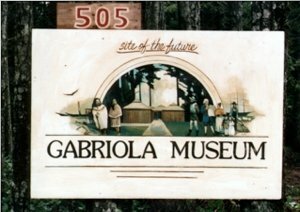 The founding of the Gabriola Historical and Museum Society on March 25th, 1986 came about principally because of the drive and vision of its first president, Bill Hjort, a Danish immigrant who moved to Gabriola in 1979 and set up a trucking business here. In addition to Bill, the founding board comprised vice-president, Wayne Olsen; secretary, Doris Mulley; treasurer, Barb Nunes; and directors Vera Wayman, Mike Dawson, Gerda Hjort, George Westwood, Paul Grignon and Ute Ewert. The first and most daunting undertaking would be finding a location and raising the funds to finance the construction of the building. With membership fees set at $6 ($5 for seniors), the initial seed money came from bake sales and membership fees while a committee was struck to research grants and other sources of funding. Although several potential locations were discussed, negotiations with the Silva Bay Resort and Shipyard progressed to the point of architectural plans being drawn up by professional engineer and architect, John Schmidt, on the understanding that a 99 year lease would be signed with Silva Bay for a parcel of land for a fee of one dollar per year. Schmidt’s distinctive design conceptualized four Coast-Salish hats as the roofline with the two central roofs being higher to accommodate taller exhibits. Just as the momentum seemed unstoppable, the project was dealt a series of blows with the deaths of Bill Hjort in 1988 and John Schmidt in 1989 followed by a change of management at Silva Bay and the subsequent cancellation of the lease agreement. The board was now forced to seek an alternative site, which was secured in November 1990 thanks to the generosity of Stan and Maxine McRae who offered the society an acreage on South Road, the land to be used exclusively for a community museum. The legal transfer of the land title (assessed at $35,000) from the McRaes to the Gabriola Historical Society was signed in February, 1993. Fundraising now began in earnest with a grant from the British Columbia Lottery Fund, bingo and casino nights in Nanaimo, and countless monetary and in-kind donations from the community. Upon completion, audited reports showed total construction costs of $220,645 of which $151,727 consisted of paid construction work; $48,861 in material and time donated by trades people on the island, and $20,057 in volunteer labour. 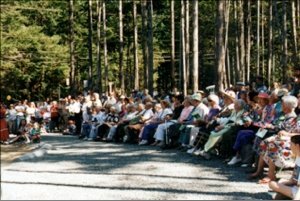 The Gabriola Museum first opened its doors to the public on Saturday, September 16th, 1995, with a ribbon cutting ceremony performed by Gerda Hjort (Bill’s widow) and Vera Wayman, the one remaining director from the original board founded nine years earlier. The exhibits included a Gabriola pioneer family; an early Gabriola Post Office; undersea life; Douglas fir forests and pioneer tools. There was also an exhibit of Paul Grignon’s paintings and outdoor exhibits included a millstone quarried on Gabriola, logging tools and a native plant garden. Plans for celebrating the Museum’s 20h year in 2015 include refurbishing the Native Plant garden and creating outdoor display markers that will make the exterior exhibits accessible year round. A new exhibit, Gabriola Roots: the Land Provides, will focus on the enduring importance of island farming. In what promises to be a banner year for the society, the Museum looks forward increasing its engagement with the community and welcomes your participation. Contact the Museum at info@gabriolamuseum.org if you have ideas, suggestions or an interest in volunteering.